Many governments choose one time for the whole country, putting themselves unofficially inside a bigger time zone with other countries that set their clocks to the same time. Others, especially if their territory is very wide from west to east, divide the country up into several time zones. And while most time zones are defined as being a whole number of hours different from Coordinated Universal Time (UTC; a modern version of the outdated "Greenwich Mean Time"), some choose to align their clocks more precisely with the cycles of the sun by shifting them a half hour or even a quarter hour forward or back. Who Changed Their Time Zones in 2016? Depending on a country's laws, redrawing the boundaries between time zones can be as simple as a local assembly voting to reset the area's clocks, or a president signing an order to modify the nation's time zones. Last year, there were quite a few of these changes, which you can see by tapping on the maps below (if you're using a touchscreen) or hovering your cursor over the maps (if you're using a mouse). Russia dominated the time zone news in 2016, with ten different regions of the country all moving their clocks forward an hour at different times during the year. The end result was a major redrawing of four different time zone boundaries. Russia has a history of time zone changes, with tweaks or major shifts happening every few years since the 1980s, so this wasn't a huge surprise. The 2016 changes started off in January, with the announcement that President Vladimir Putin had signed off on a time change for the Zabaykalsk territory of Siberia. The region would set its clocks one hour forward on March 27, moving from Irkutsk Time (UTC +8) to Yakutsk Time (UTC +9). Not long afterwards, he approved a second time change, this one for Astrakhan province in Russia's southwest. Astrakhan would also set clocks one hour forward, on the same day as Zabaykalsk, leaving Moscow Standard Time (UTC +3) to join Samara Time (UTC +4). But that wasn't the end of it. On April 24, less than a month after the big March changes, the far eastern Magadan province also moved an hour forward, leaving Vladivostok Time (UTC +10) to join Sakhalin and Srednekolymsk in the UTC +11 time zone, which was then renamed Magadan Time. 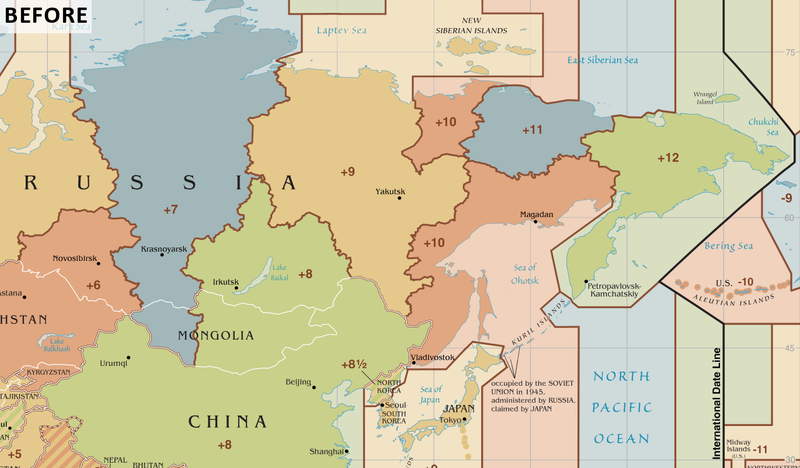 The next month, on May 29, yet another Russian region set its clocks forward an hour, with western Siberia's Tomsk province joining the Altai Republic and Altai territory in moving from Omsk Time (UTC +6) to Krasnoyarsk Time (UTC +7). Then, on July 24, Siberia's biggest city jumped on the bandwagon, with Novosibirsk province joining the neighboring Tomsk and Altai regions in setting clocks an hour forward (the previous changes had left it an hour behind most of the surrounding areas). Before the year was done, one more Russian region had switched time zones. On December 4, Saratov province joined Astrakhan and Ulyanosk in setting its clocks forward an hour from Moscow Time (UTC +3) to Samara Time (UTC +4). Besides Russia, there were a few other countries that carried out time zone changes last year. Not far away from some of the changing Russian time zones, Turkey made a shift of its own. Until late 2016, Turkey's standard time zone was UTC +2, just like every other country on the eastern Mediterranean, such as Greece, Syria, Israel, and Egypt. During the summer, Turkey would set clocks temporarily forward an hour, a common practice that's known as daylight saving time (DST). But in September, Turkey's government decided not to set clocks back to the normal time for winter anymore, leaving the country permanently in UTC +3, alongside Moscow, Saudi Arabia, and East Africa. Not to be left-behind, the self-declared Turkish Republic of Northern Cyprus quickly decided to join its sponsor country in the time zone change, leaving the island of Cyprus split awkwardly between different time zones for its northern and southern areas. Back in 2015, Chile had done the same thing as Turkey, shifting forward an hour from UTC -4 to UTC -3 by canceling the end of daylight saving time. But in 2016 the country reversed course, reintroducing DST changes so the country's mainland would return to UTC -4 in the winter. The remote Chilean territory of Easter Island, known locally as Rapa Nui, is two hours behind the rest of the country, but follows the same DST rules. So after the 2015 change, Easter Island was permanently in the UTC -5 zone, even though the seas surrounding it are loosely considered to be in UTC -7. But with Chile's 2016 policy reversal, the island returned to UTC -6 for the winter. 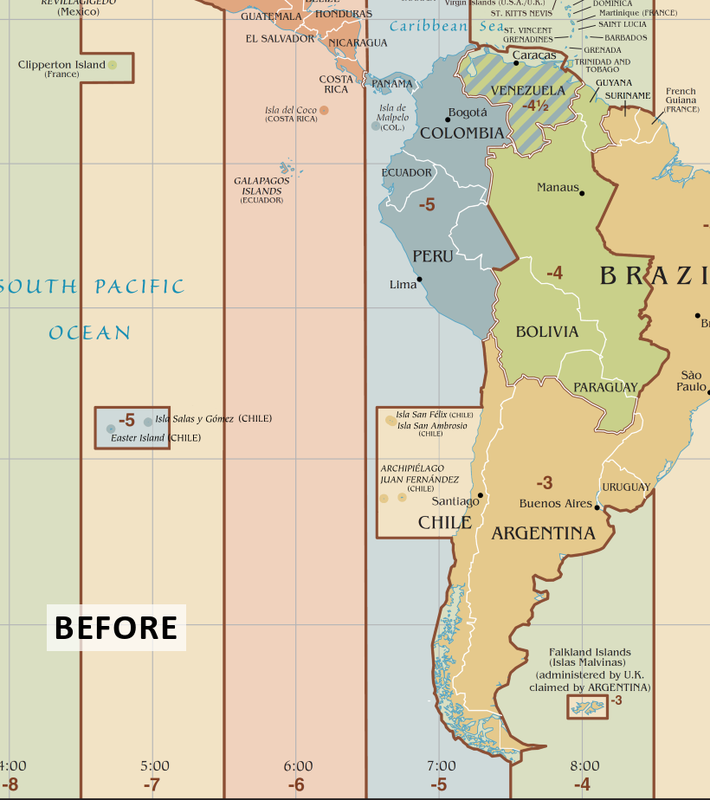 Meanwhile, not long after the country set clocks back an hour for the winter, southern Chile's Magallanes region decided it didn't like returning to the old time zone, and in December 2016 a law was passed to let it stay in UTC -3 year-round again. The law also affected Chile's claimed territory in Antarctica, which includes a US research station. Finally, Venezuela also changed its clocks in 2016, completely erasing one of the world's time zones off the map. Since 2007, Venezuela had been the only place in the world using a time zone of UTC -4:30 (which it also used from 1912 to 1965). But last April, President Nicolas Maduro announced that the country would set clocks ahead half an hour, returning to the more conventional UTC -4 time zone. The stated purpose was to counter a severe energy shortage. By lengthening evening sunlight hours, it was hoped that the country would save electricity, because people would wait an extra half hour before turning their lights on in the evening. Since no other place currently uses the UTC -4:30 zone, Venezuela's change entirely deleted it from the world time zone map. What the maps in this article don't show is that many places move temporarily forward an hour in the summer for daylight saving time (DST) - and these policies change just as often as permanent time zones. In 2016, Tonga reintroduced DST after a period without it, moving its actual time in the summer from UTC +13 temporarily to UTC +14. 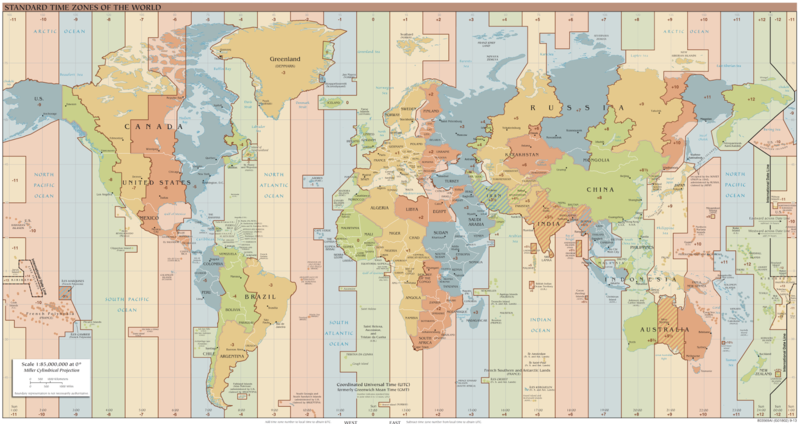 The UTC +14 time zone, used permanently by parts of the country of Kiribati, is the farthest-forward time zone in the world. Since Tonga is in the southern hemisphere, where summer runs from December to March, this means Tonga and Kiribati together became the first countries to enter the year 2017 on January 1. Curiously, clocks in the UTC +14 time zone show the exact same time as clocks in the UTC -10 time zone (used by Hawaii and French Polynesia), but the date is exactly one day later. Egypt's government also planned to reintroduce DST in 2016, after abolishing it twice in the past. But the time changes are so unpopular in Egypt that the government was pressured into canceling the move just a day before some said it would have gone into effect. Meanwhile, Azerbaijan also continued a series of flip-flops on whether to use DST, canceling it in 2016 just 10 days before clocks were set to change. Haiti did the same. The British Caribbean territory of the Cayman Islands also canceled plans to start using DST in 2016, and the government of the disputed Palestinian territories delayed DST by a week, bringing it closer in line with the dates used by Israel. What Time Zones Will Change in 2017? Although an academic proposal to abolish all the world's time zones is unlikely to happen anytime soon, there are plenty of proposed time zone changes that might come about in 2017. Countries like Namibia, Jordan, Spain, and Hungary are considering changing their time zones, while the European Union, several US states, and at least one Canadian province might abolish daylight saving time (Mongolia has already decided to get rid of DST in 2017, while Haiti has already reversed its 2016 DST cancellation). Several US states are also debating proposals to switch time zones, either by making DST permanent or by just moving both standard time and DST. One of them, the far northwestern state of Alaska, could merge both its UTC -9 and UTC -10 time zones into the UTC -8 Pacific Time. The change would effectively shift the remote Aleutian Islands two hours forward. Stay tuned to PolGeoNow's Twitter feed for updates as we learn about them!